Winning election as speaker of the House is no way to win a popularity contest, as Rep. John Boehner has discovered. 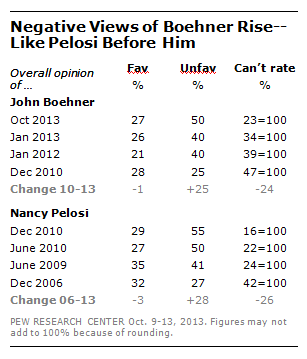 In nearly three years as House speaker, Boehner has seen his unfavorable rating among the public double – from 25% to 50%. The Pew Research Center’s most recent survey found that 27% view Boehner favorably, 50% view him unfavorably, while 23% are unable to rate him. In December 2010, shortly before he became speaker, 28% had a favorable impression of Boehner, 25% viewed him unfavorably and nearly half (47%) had no opinion. Opinions of Boehner’s predecessor, Rep. Nancy Pelosi, followed a similar trajectory during her four years as speaker. Views of Pelosi were mixed at the start of her tenure (32% favorable, 27% unfavorable), with many (42%) unable to rate her. By December 2010, in her final month as speaker, nearly twice as many had an unfavorable opinion of Pelosi (55%) as a favorable view (29%). Not surprisingly, most of the rise in negative views of Boehner and Pelosi has come among members of the opposing party, as well as political independents. But unfavorable views also increased among Republicans for Boehner (by 14 points since December 2010) and Democrats for Pelosi (by 11 points from 2006-2010). Unfavorable views of the two speakers who served prior to Pelosi — Reps. Dennis Hastert and Newt Gingrich – also increased during their tenures. Shortly after the GOP’s big victory in 1994, which propelled Gingrich into speakership, 28% viewed Gingrich unfavorably; by January 1997, a little more than two years later, 65% had a negative opinion of him. But Gingrich’s unfavorable rating declined toward the end of his time as speaker (49% unfavorable in October 1998).